First things first, if you haven’t yet seen that Oscars poster above by Ollie Moss, I insist you click on it and check out the full-sized version. Absolutely amazing. 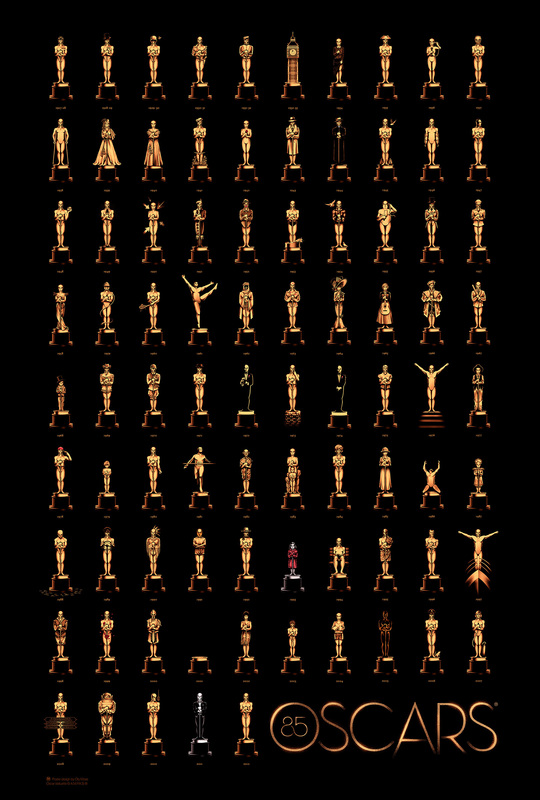 He re-interpreted the Oscar statue to represent every Best Picture winner. Some of them are very clever. I love watching the Oscars every year, because I love movies more than I love drawing breath. I’m not one of these a-holes who complain about how long the show is every year (because I don’t mind it being long), I don’t overanalyze the host’s performance, and I don’t watch for the fashion (unless someone/something really sticks out, see below). I watch it as a celebration of excellence in movies, and as an aspiring filmmaker, it never fails to inspire me in that regard. That said, I do have thoughts on the show each year, and for the first time on this blog, I thought I’d share those with you. Here is the good, the bad, and the ugly of the 85th Academy Awards.